The Unlikely Boat Builder: Wooden Boat Show - Boats! Wooden Boat Show - Boats! Helena and I went to the Wooden Boat Show in Mystic this weekend with several goals in mind. One of them was to see the Bronze Casting for Boat Builder's demonstration. I've already discussed that elsewhere. Another goal was to get ideas for my next boat building project. Sorry... As I was saying, with good stout oars, Cabin Boy rows extremely well. Several times, I have had to row into a stiff breeze to get back to the Blue Moon, and it was always easier than I expected. However, Cabin Boy is a bit small for two people. Okay for the occasional short trip ashore, but you do have to keep a wary eye on the freeboard. The question is, what to build? To get some expert advice, I stopped by the Atkin Boat Plans booth at the show to ask Pat Atkin for her opinon. As I expected, Pat was able to diagnose my needs almost immediately, and had a terrific recommendation: Vintage, a William Atkin design. Vintage was designed for the famous Thomas Flemming Day, founder and editor of the Rudder -- a legendary sailing magazine, now long gone. 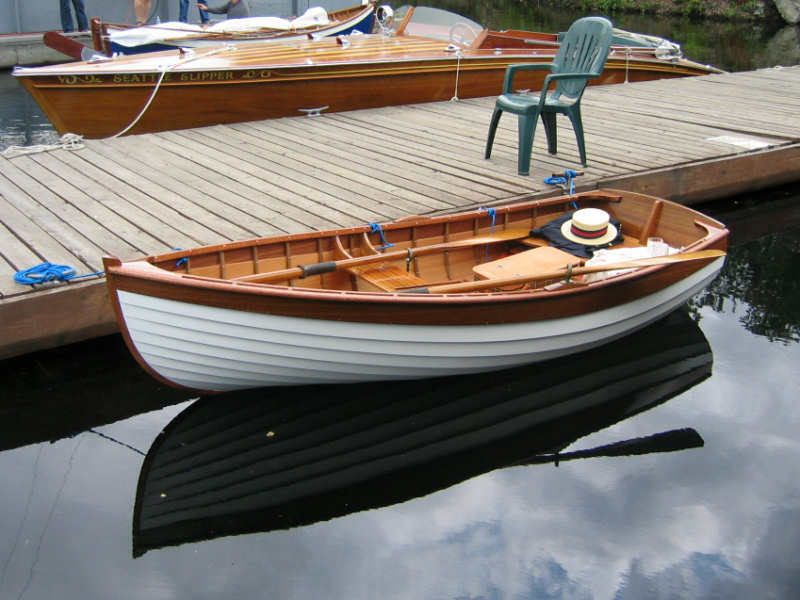 She's a 10' round-bottom, lapstrake boat -- perfect for my requirements, since I got the hang of lapstrake construction with Cabin Boy, but would like to try my hand at a round-bottom boat. So Vintage is a definite possibility. She'd be a big challenge for me, no doubt, but I think I could just manage her. And she'd be a perfect tender for the Blue Moon. On the other hand, I also need to think about fitting out the Blue Moon's interior, this winter. The current spartan layout is okay for me, but I'd hesitate to inflict it on Helena for more than one night. The secret of keeping wives on boats, I think, is to treat them like honored guests, and that means comfortable accommodations and 'facilities'. And, of course, good food and cold drinks. None of which the Blue Moon readily supplies at the moment! So, I'll just have to see if I can juggle both builds this winter. Assuming I can get the Blue Moon to NY before the snow flies! Speaking of which, I'm dying to get back down to FL to do the next leg (to Myrtle Beach, SC), but I'm stuck working on a new software project for at least a couple weeks... You might think, from reading this blog, that I'm retired, but far from it. Not with two kids still in college. I'm just lucky enough to have a business that I can run reasonably well from the cabin of a small boat. Except when I've got a big project on, which I do at the moment. So the Blue Moon will have to wait a bit.